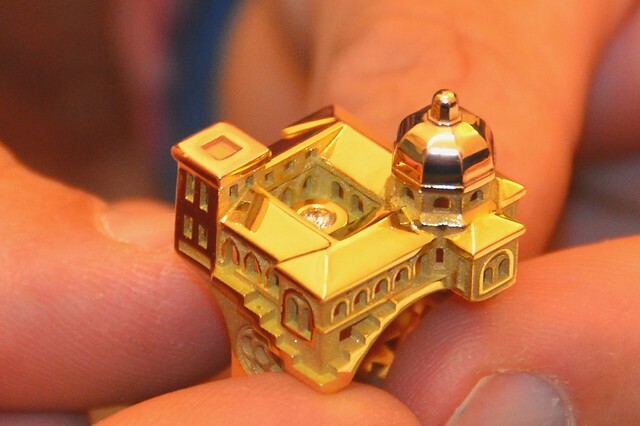 These surprising words come from master jeweler and artist Philippe Tournaire. They’re highly unexpected from someone who makes an excellent living from precious metals and gems. He presses the point, not giving up. Useless? Just as well because I’ve been eyeing a ring and wouldn’t want to spend so much on something… useless. Tournaire isn’t a place you simply walk into and buy: he is a creator and will take his time talking to you, looking at your hands, holding them in his, and getting a sense of who you are. I gaze at a conglomeration of buildings in a jumble of white metals I’ve slipped on my finger – and he agrees it is definitely “me”. Part M.C. Escher, part I.M. Pei, Tournaire marries art and architecture in squares, triangles and circles in a way that has made him famous not only in France but overseas. He has a shop in Paris on the Place Vendôme, the ritziest of squares – but he’d rather stay home. “This is where I have my family. There’s a belief in France that if you’re not from Paris, if you’re from the provinces, you can’t be any good.” He’s certainly proved critics wrong. A native of Montbrison, this former electronics engineer has been making jewelry since he was old enough to twist his mother’s forks into bracelets. He is utterly self-taught, getting his inspiration from, of all things, architecture. 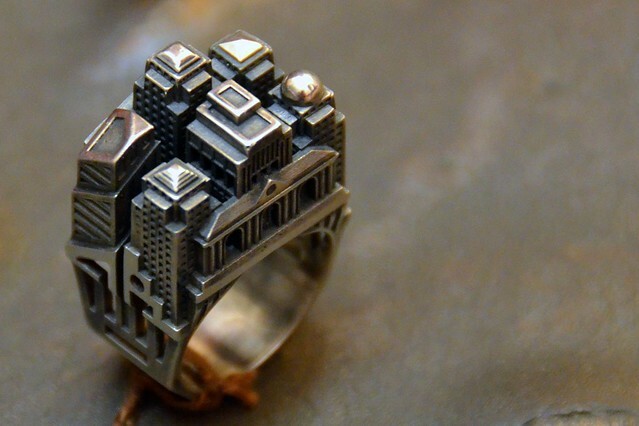 I recognize the cupolas of Haghya Sophia and the skyline of Manhattan; I just wouldn’t have imagined wearing them on a finger. Bye for now Philippe, but I may be back for that ring! Montbrison is a small historic town in the Loire, wedged between the Loire River and France’s mountainous Massif Central. 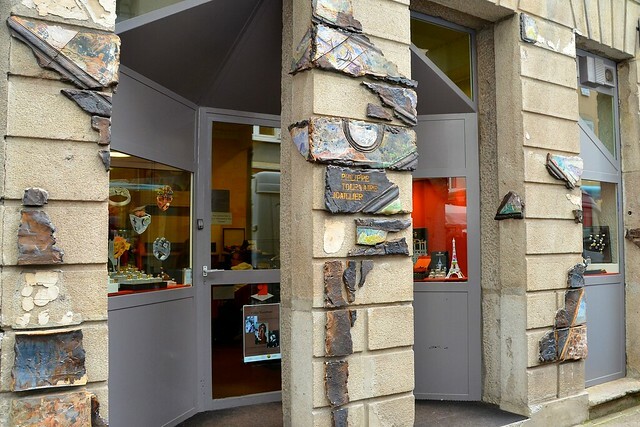 It is similar to many other French towns its size but for some reason, it attracts artisans. Down the Rue Tupinerie from Tournaire and partly hidden to me by the Saturday market stalls is a modest shop from which another Philippe turns his hand to art of a different kind as bags jostle with wicker baskets between the stands of fresh produce. 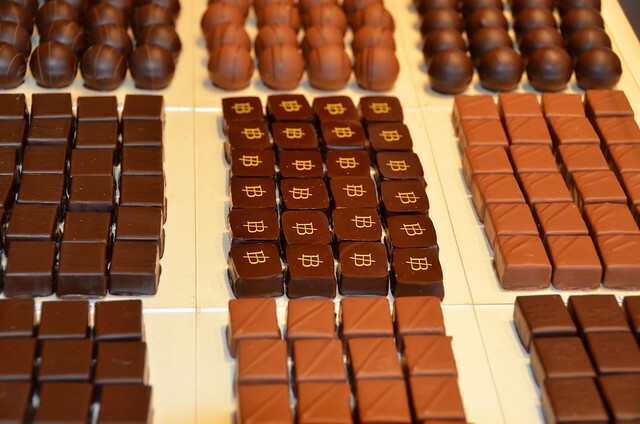 Philippe Bel is a master chocolatier whose delicious creations make chocoholics fawn all the way to Japan. He runs up and down the stairs of his chocolate workshop, fronted by a large glass pane lined with rows upon rows of perfect little squares. In the corner, a rather unusual statue, a madonna holding a child, all made of chocolate. “This sculpture was my entry to the MOF in 2004,” Bel explained, grinning contagiously. MOF means Meilleurs Ouvriers de France, a distinction awarded to the country’s top artisans. “It takes a full year to prepare, after work, on weekends and holidays, it is gruelling. You are graded on everything – materials, technique, taste. It gives me goose bumps just thinking about it.” And so it should; he failed the contest the first time, at a difficult personal time, but he decided to try again. This time he won. His modest shop has become too confined and he is building a new kitchen further out of town. Here, in his old premises behind the store, machines are tucked under stairwells and against walls, several young apprentices almost fighting for space. Philippe Bel isn’t from Montbrison but from the Yvelines, just outside Paris. 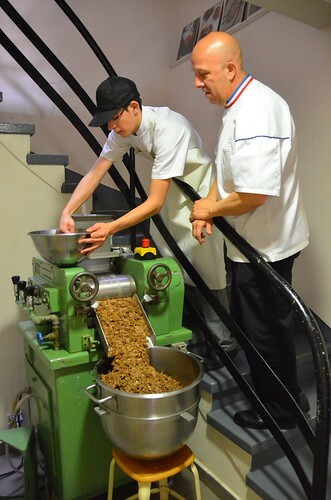 He had a distinguished career before opening his own shops but chose Montbrison because it was pleasant, friendly, comfortable – and because it didn’t have any chocolatiers. I learned plenty about chocolate during my visit: that it was seasonal, mostly from September to April because of the heat of summer – and we know what heat does to chocolate. I learned that a small square weighs about 10g, and that exact recipes exist for chocolate, allowing trainees to replicate them almost perfectly; and I learned that perhaps, just perhaps, there is nothing on earth so mouth-melting as a freshly-cooked and sweetened orange rind dipped into deep, dark chocolate. Cecile, Philippe’s wife, makes sure I get my delicious orange rinds! Enjoy Philippe Tournaire’s creations by visiting his website for a true visual treat; for something more earthy, if you’re in Montbrison head straight for Philippe Bel’s chocolate shop. Not sure how to get here? Have a look at this Google Map. If you’re driving, Montbrison is 1h15 from Lyon and under 3 hours from Geneva – through beautiful countryside, I might add. Wow, those rings are incredible! 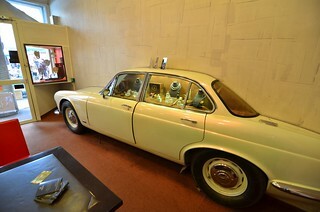 I’d love to visit and look at his collection. Have a look at some of the designs on his website – he is extraordinary if you like bold, geometric jewelry. I’m off to buy a lottery ticket now!